More Mini Hardtop photos to go along with Michael's review. Scads of details you won't find on a GTI. The changes aren't terribly obvious from this angle. The most artful GTI to date. Also an iconic shape, but with far less eye candy than the Mini. Laid back headlamps, large protruding grille look fishy. 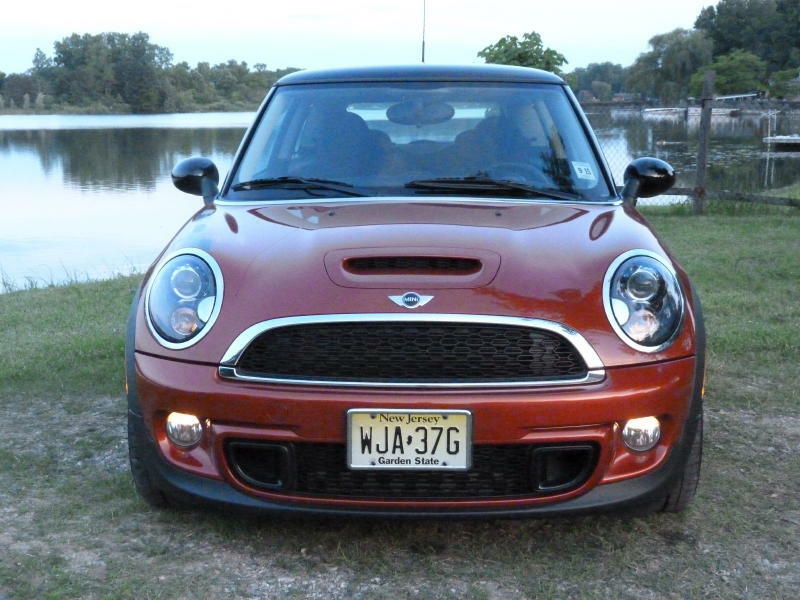 Hood scoop still indicates this is an S.
Previous Mini Hardtop had a cleaner yet sportier face. The dramatically longer overhangs are most obvious from the side. Four doors don't look quite right. Note how much tighter the overhangs used to be, especially in the nose. Plus more glass. The new Mini looks best from the rear quarter (because you can't see its face). A small distant windshield flanked by thick pillars. Why so bunker-like? The Mini's interior is also crammed full of design. Note buried infotainment control knob. Aside from its standard plaid seats (black leather is optional), the GTI has a far plainer interior. Better located iDrive control knob, above seats and nearly level with the armrest, in a BMW. Improved ergonomics, but work remains to be done. Comfortable and supportive seats. Many more stylish alternatives to the standard black leatherette. More rear legroom than in previous Hardtops, but still a squeeze. A bit more cargo room than before in the new Hardtop 2 Door. Considerably more cargo room in the new Hardtop 4 Door. How often will you need even more? 4 door can hold much more than 2 door. Floor can be raised to make it level with the folded seats. If you do need even more cargo volume, the GTI has it. So much style everywhere else, why not under the hood? New engine delivers good but not outstanding performance and fuel economy.